Warning: this post may get a little heavy and personal. Don’t say you were never warned. When our Bible study read through the Bible last year from cover to cover, the activity interrupted my own reading through the Bible cover to cover. Except I wasn’t attempting to do it in 90 days. Instead I was reading in depth and at most a chapter a day with a commentary in hand—which I started in the summer of 2008 and am still going right along. But the 90 Day read couldn’t have come at a better time in my life. My walk with God had grown stagnant. I was just in a funk the year before—the many woes that come with this world were just getting to me. There were just a lot of tragedies and sadness in the lives of my friends and family and I was allowing it to get me down. My daily reading of even a chapter a day of the Bible dwindled down to not reading at all. So getting back into reading every single day, about 12 pages every day, really got me back into the habit of digging into the scriptures. In April of last year, when the challenge was complete, I picked up where I had left off with my own reading: the Gospels. And since then I have wanted to start another little series of posts like I did with the 90 Day challenge. Posting each week on what I read really helped me tune into the reading. It wasn’t just something to check off the list once I read that day’s portion, but I really had to listen and to apply the Word to my life. And again recently, I’ve just been so sad. There’s really no other way to say it. And I feel the need to “jumpstart” my time with God again since I can definitely say I have been avoiding Him. Just reading isn’t going to be enough though, growing in knowledge of our awesome God isn’t the same is having a relationship with Him. All that to say, I decided to combine my recent love of the handwritten lettering and my reading by starting weekly scripture postings again! So I will start posting each week (or so?) a favorite verse from whatever book I am into. Along with a thought or two. Now, a year later, I am hoping to get back to posting some spiritual food here on my blog. Not only to share with all of you, but to keep myself accountable to really listening in to what God has left us in His Word. STARTING OFF, I just finished the book of Philippians last week—which I really loved and would recommend to anyone looking to find the JOY in life—and am now deep into Colossians. I am really taking this verse to heart as I am still struggling with the things of this world, the sin of this world, the death of this world. We each have an eternal purpose while we are shortly here on this earth. Instead of thinking of today’s worries, and taking to heart yesterday’s sorrows—or even using the everyday joys to temporarily pacify—I must think about the things above for Jesus conquered this world and all that is in it. 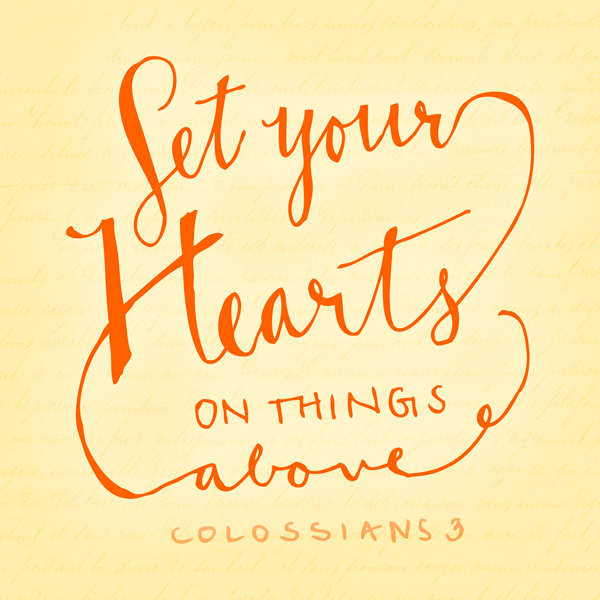 For the things above—i.e. Jesus’ loving sacrifice for you—will never change nor ever fade. He conquered death for me, for you. He conquered the devil and rose again to be in His rightful place with God. He rose so that we may rise with Him and take our place in heaven with Him for all eternity. And none of this world’s worries will follow us there. Thank you for sharing this post! When messages such as this are put into print- the Holy Spirit uses it, supernaturally, to touch/change lives. Thank you!